If you have a medium family that is looking for a travel trailer to explore the outdoors, then look no further! 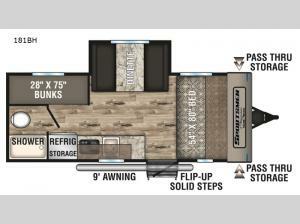 This KZ Sportsmen Classic 181BH features plenty of sleeping areas including a set of bunk beds and a full size 54"x80" bed. The booth dinette can also be turned into another sleeping area giving you the option to invite more friends or family. With the overhead cabinets throughout, you won't have to worry about storage space. Plus there is even an exterior pass-through storage for you to keep all of your outdoor gear nice and handy. When you're ready to enjoy the great outdoors then grab a chair and your favorite drink to head outside and relax underneath the 9' power awning with LED lights to keep the good times rolling even at night! Each KZ Sportsmen Classic provides all of the at-home amenities in an ultra lightweight, easy to tow package. 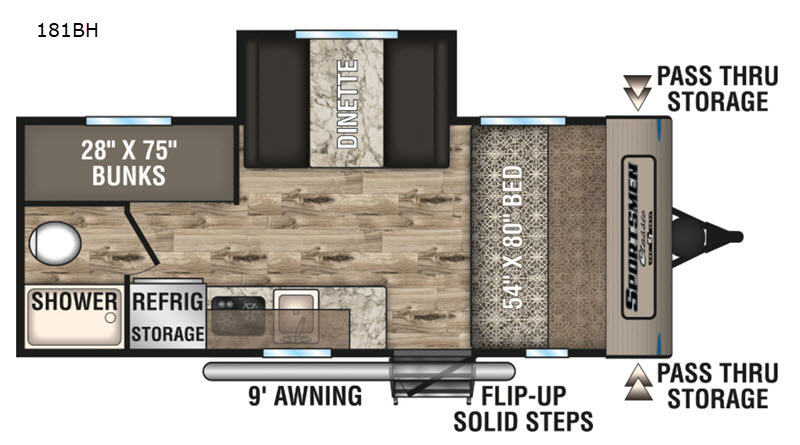 All units are family-friendly and feature roomy, comfortable living spaces complete with amenities such as a digital media stereo with Bluetooth technology, 12 volt USB ports, and a Key-Alike system so that one key fits all baggage and entry doors, plus so much more! The Sportsmen Classic's are all built strong by the KZ Exclusive Tough-Shield exterior, the front diamond plate, and the Alum-a-Tough roofing which is backed by a 12-year warranty. You can also choose an Off-Road package that offers 15-inch mud tires and extra ground clearance so you can go where the fun is!